1. Start buy making Sushi Rice (If not available at your market, then find a Japanese food market) Cooking this rice is the same as any other, but the rice has a different shape and consistancy. 3. Make sure you have cut the bones and bloodline out of your fillets. Select a piece that is approximately 1/2" - 1" thick. 4. Make sure to have around 1/8 - 1/4 pound per person. 7. Take the rice vinegar and sprinkle it into the cooled rice stirring and fluffing the rice. Taste the rice to ensure you have the right amount of vinegar to your liking. There should be just a hint of flavor or slightly more. 8. Place servings of rice into individual bowls and lay in the bite sized slices of fish on top. 9. Drizzle the Chili Sauce over the top to taste. 10. 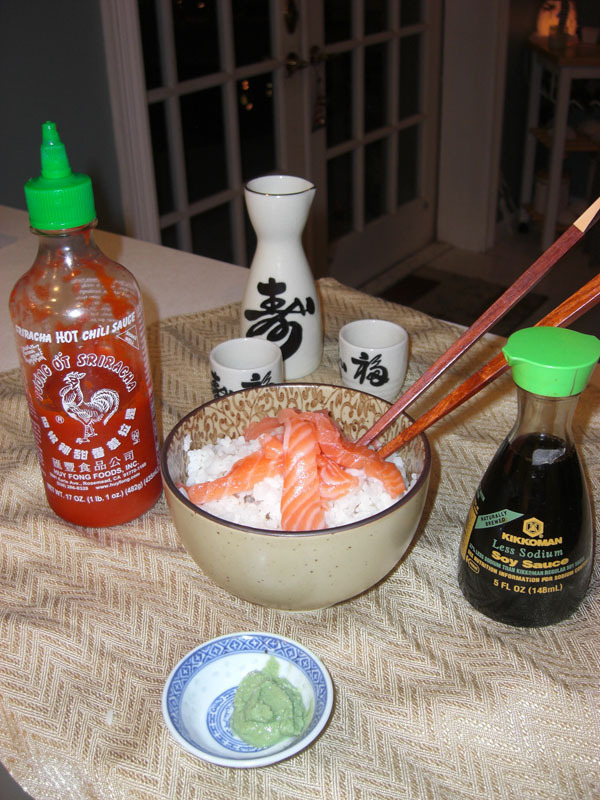 Mix Wasabi and Soy Sauce in a small amount to your taste and drizzle this a bit heavier than the Chili Sauce. This should be around two tablespoons of Soy with a lump of Wasabi around the size equal to 2-3 pencil eracers. 11. Grab your fork or Chop Sticks and dig in!